Just when you thought the Asics Gel Netburner couldn’t get any better, wait until you try the Asics Gel Netburner 15. 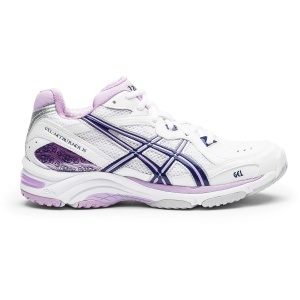 When it comes to women’s netball shoes, the high-performance Asics Gel Netburner 15 ticks all the boxes. Before you even put them on, the super stylish look will grab your attention, ensuring you will look the part both on and off court. If you suffer from strain to your Achilles tendon, the Asics Gel Netburner 15 shoes are perfect as they feature Plus3 technology, which adds an extra 3mm to the heel gradient to reduce this stress. Netball creates a lot of stress on the knees, ankles and feet, so cushioning for comfort against impact is important to help avoid injury. The Asics Gel Netburner 15 features the Soft Top DuoMax support system and gender-specific cushioning (essentially cushioning built to best support a female foot), as well as rearfoot and forefoot Gel units inside the lightweight Solyte midsole. These netball shoes certainly know how to look after your feet during all aspects of the game. Asics has thought of everything – even toe drag is no longer a problem, with an Asics High Abrasion Rubber (AHAR+) outsole, and extra protection is provided with the reinforced trusstic system, which provides arch support and torsional stability. And if popularity is anything to go by, this new model Asics Gel Netburner 15 definitely proves itself as a worthy contender on the netball court. Sportsmart currently stocks the Asics Gel Netburner 15, as well as many other netball shoes for both junior and senior players. View our netball shoes online, or visit one of our Melbourne stores to get expert advice on choosing the right netball shoes for your needs.